I always buy taho (sweetened soy bean curd) every chance I get. I’ve had the usual taho with arnibal (brown sugar and vanilla syrup) and the flavored taho from stalls at the mall, but I’ve never tasted Strawberry Taho before, so when we went to Baguio two weekends ago, I told myself that I wouldn’t leave Baguio without having tried it, and I did! The Strawberry Taho we bought was warm, just the way I like it. Instead of arnibal, this Strawberry Taho uses strawberry syrup, and it has strawberry bits, too. The sweet-tart goodness of strawberries combined with the taho was delightful. Even the little boy enjoyed it. 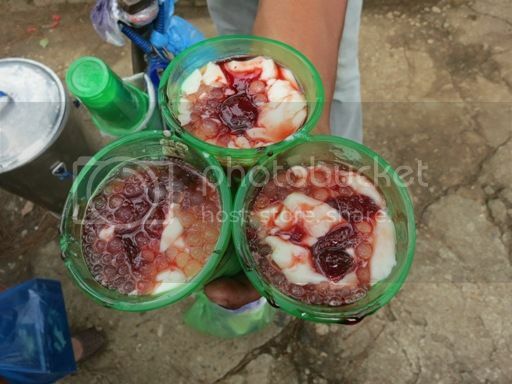 Have you tried Baguio’s Strawberry Taho? This entry was posted in Baguio, Strawberry Taho. Bookmark the permalink. I have been to Baguio but haven’t tried the Strawberry Taho. I think its so delicious. Oh gosh, I love love love Strawberry Taho! And I miss it!